The saying of course refers to the belief that it not only takes parents to raise a child successfully, but the process also needs grandparents, aunts and uncles, friends and neighbors, teachers and pastors, even strangers. By joining together, the child benefits from the love, understanding, knowledge, as well as the watchful eyes, of many people working as a team to raise a happy, healthy child. But what does it take to raise a village? The same concept of utilizing teamwork to raise a child also works to maintain a happy, healthy community. Nestled along 72 miles of beautiful beaches and home to America’s Space Program, Brevard County is captivatingly unique and offers its residents an exceptional standard of living. Paramount to preserving this high quality of life, the creation of high paying, value-added jobs is essential. Only through thoughtful economic development is a community able to sustain an existence that is not only fruitful but enjoyable as well. By strategically targeting specific industries, such as high tech manufacturing, it is possible to increase the number of quality jobs available to Brevard residents substantially contributing to a more prosperous community. But to generate the projects that will create these jobs, the Economic Development Commission of Florida’s Space Coast calls upon a vast network of public and private organizations and agencies through which invaluable contributions and services have been offered. This teamwork has and will continue to ensure the growth that takes place within Brevard’s business community, as a result of company relocations and expansions, enhances the quality of life in Brevard. 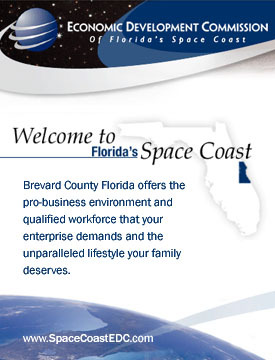 In addition to companies essential to the space program, Brevard’s manufacturing community also includes companies that manufacture defense and commercial electronics, circuits for analog and wireless networking, aircraft communications and navigation systems, and optical systems for defense and medical products. Two of the projects the EDC managed in 2004 include the relocation of Avidyne Corporation, developer and manufacturer of advanced integrated avionics for general aviation aircraft, to Melbourne and the expansion of Delta Group Electronics, an electronic manufacturing services (EMS) provider, in Rockledge. Together, those manufacturing companies are expected to create more than 350 direct and indirect jobs creating a net wage impact of more than $21 million. Those are just two examples in a long line of successful companies here on the Space Coast that contribute high wages and tax revenues to our community. To secure new expansion and relocation projects, the EDC works closely with site selection consultants and industry contacts to identify companies looking to relocate to or expand in Brevard. With literally thousands of locations to choose from, site selection is an extremely competitive process. The EDC enlists the assistance of State, County and City officials with the administration of financial incentives, which increase the attractiveness of Brevard to targeted companies and are often critical to a company’s ultimate choice of location. Every project requires key elements specific to that company’s industry. Some companies need to be located on airport property or at a seaport. Some companies must have access to a workforce with a certain skill level. For some companies the availability of training programs is important. For other companies the availability of certain technology is important. The EDC often partners with local air and seaports, workforce agencies, colleges and universities, technology incubators, utility companies, among many others to secure a successful outcome. Convincing a targeted company that Brevard County is the ideal location for their business is most definitely a community effort. It is the EDC’s hope that Brevard continues to be blessed with organizations that understand the important role teamwork plays in building community. For more examples of recent relocation and expansion projects click here posted on the EDC’s all-new Web site.